Take the opportunity to personalize your watch, bracelet or anklets with a charm piece. There is no cost to add one of these lovely charms to your selected purchases. Please - only one free charm for each watch, watchband or bracelet ordered. Our charms are different sizes. If you order a free charm that is too big or too small in relationship to the beads used for the watch, bracelet or anklet, we will replace the charm with one that is similar and will look better on the item. Free charms are subject to availability. You may receive a similar charm if the one you request is out of stock. 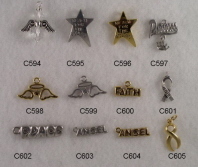 Free - Charms to add to Watches and Bracelets.